After a slow start, I’ve finally got round to finishing my first attempt at nålebinding – by making a möbius strip (a mathematical object which is a surface with only one side and one edge). Here’s a step-by-step tutorial. I’m left-handed and so is this tutorial, but I hope my instructions are clear enough for right-handers too. 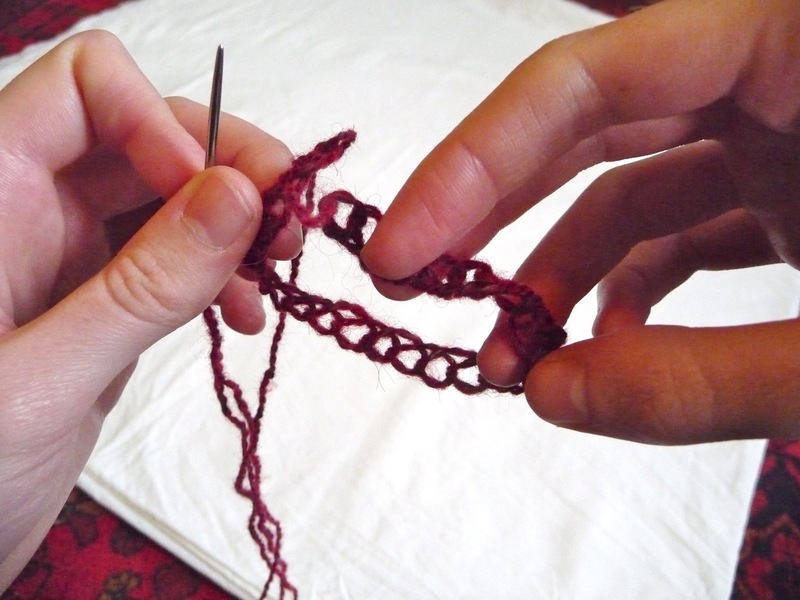 Nålebinding is a technique used to make a knitted structure. 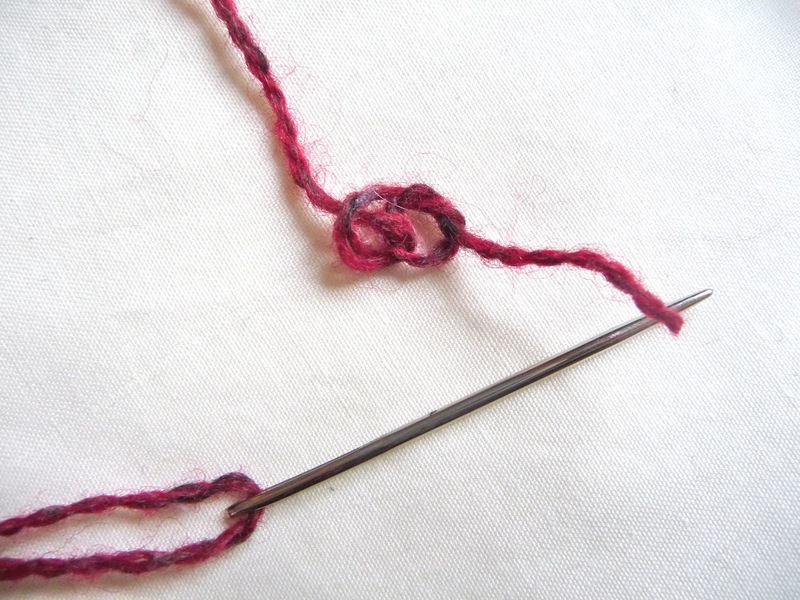 Instead of using two needles to create rows of loops, the loops are sewn with a threaded needle – creating true stitches. 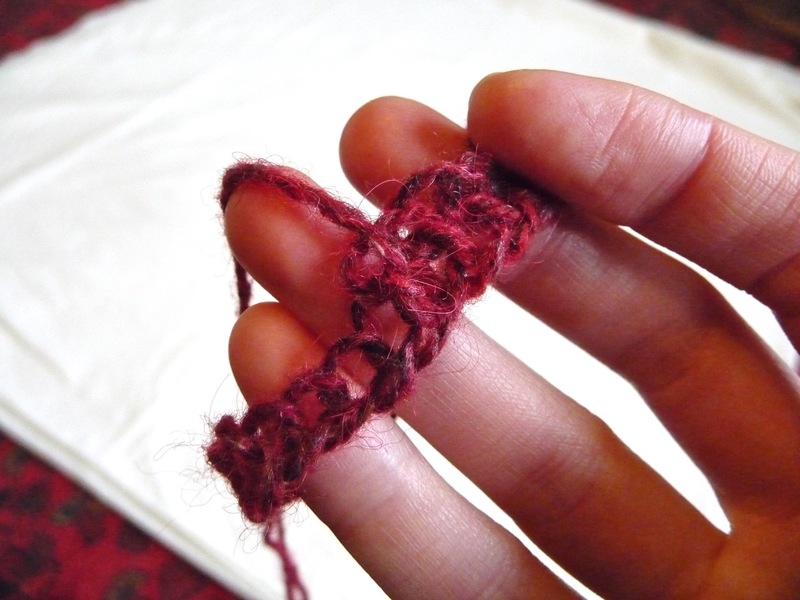 Unlike two-needle knitting, nålebinding does not unravel, and the yarn must be continually rejoined because the entire working length must be pulled through each stitch (it doesn’t work with a ball of yarn!). It is thought to be much older than two-needle knitting, possible originating in Egypt. These Egyptian socks in the Victoria & Albert Museum date to around 250 to 420 AD. Cut a length of yarn about 1 metre long and thread the needle. 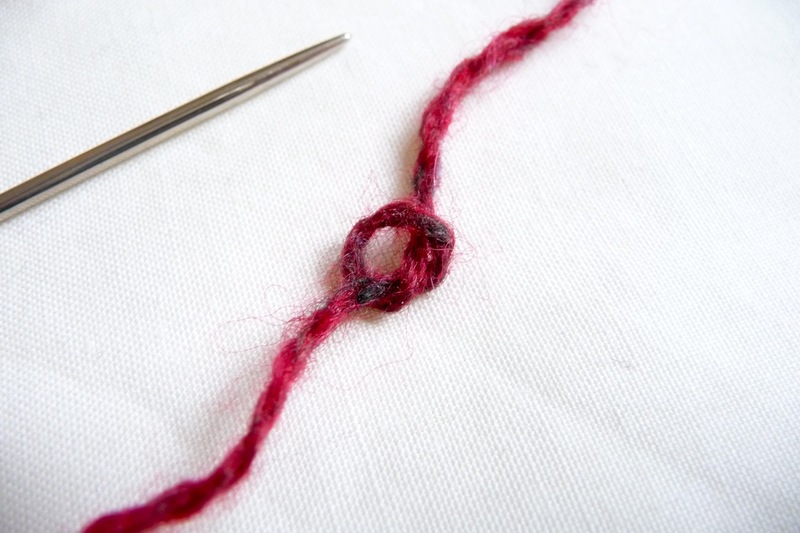 Make a loose knot with the yarn, leaving a short tail. 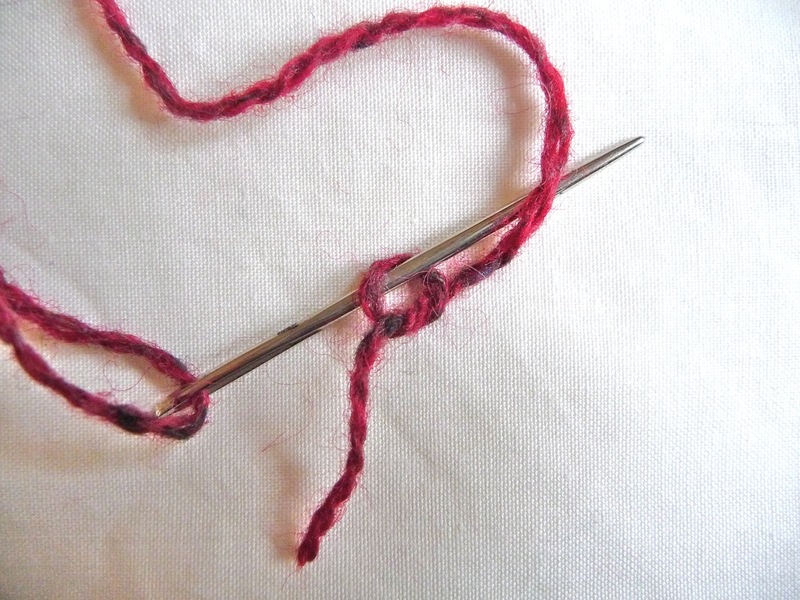 Insert the needle into the loop of the knot, and underneath the working yarn. 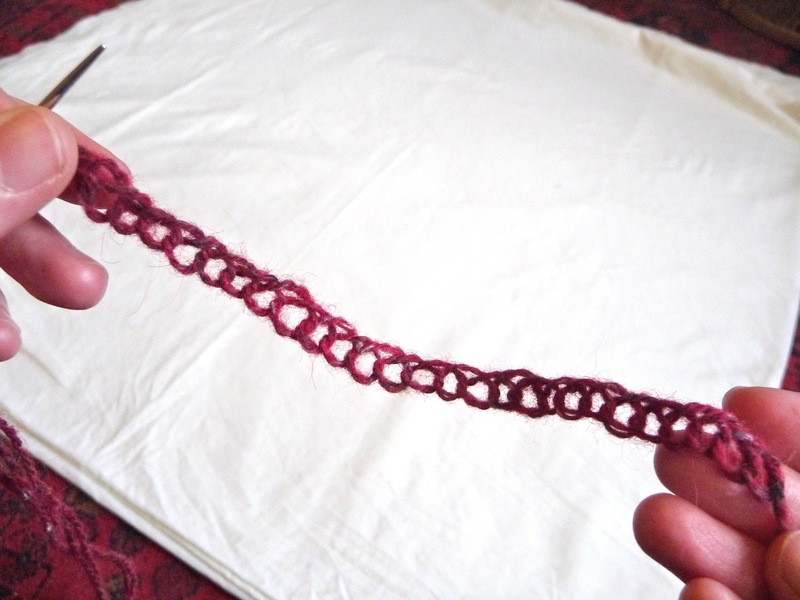 Pull the yarn through, until you have a loop about the same size as the first one. 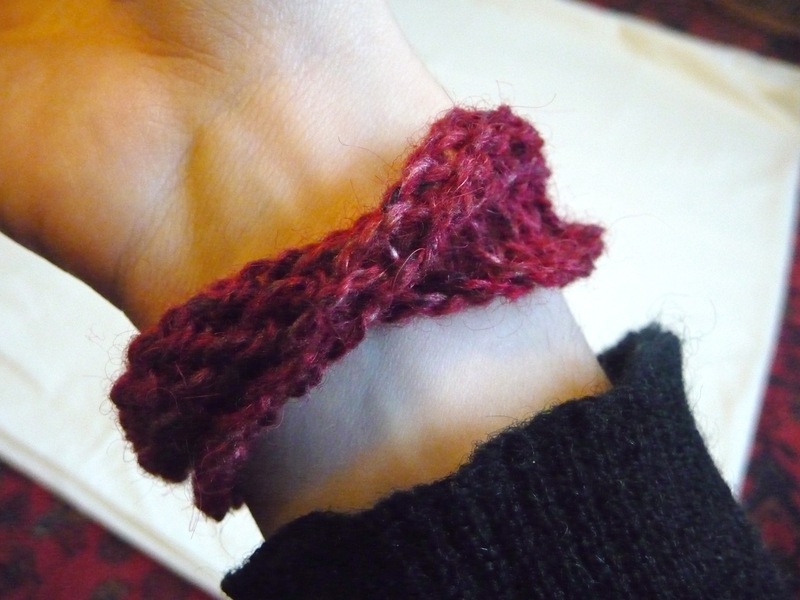 Repeat steps 2 and 3 until you have a row of about evenly sized loops about the circumference of your wrist. 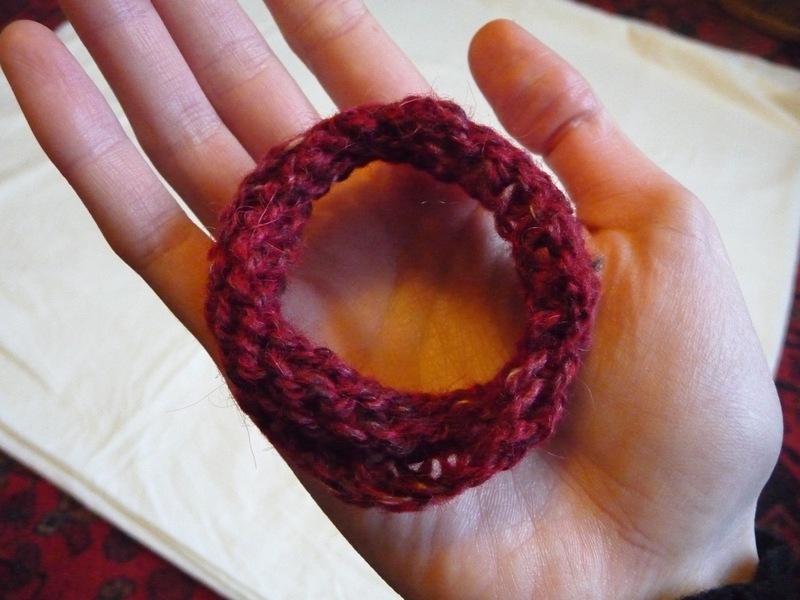 To make your mobius strip, put a single twist in the row of loops, then join the loop by sewing a single stitch into the very first loop and pulling the yarn through. Alternatively you can make a straight tube by leaving out the twist. 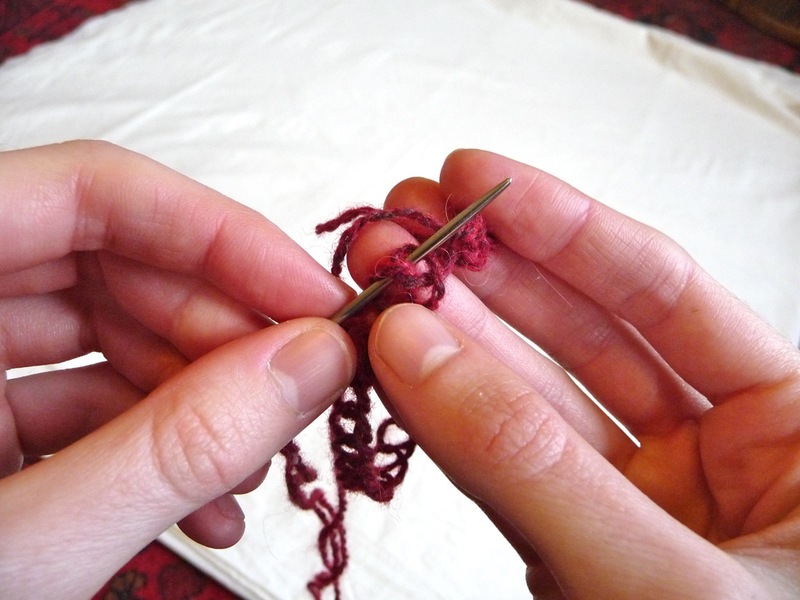 Start the first round by inserting the needle into the join of the first two loops of the cast-on row. Pull the yarn through to make a loop. 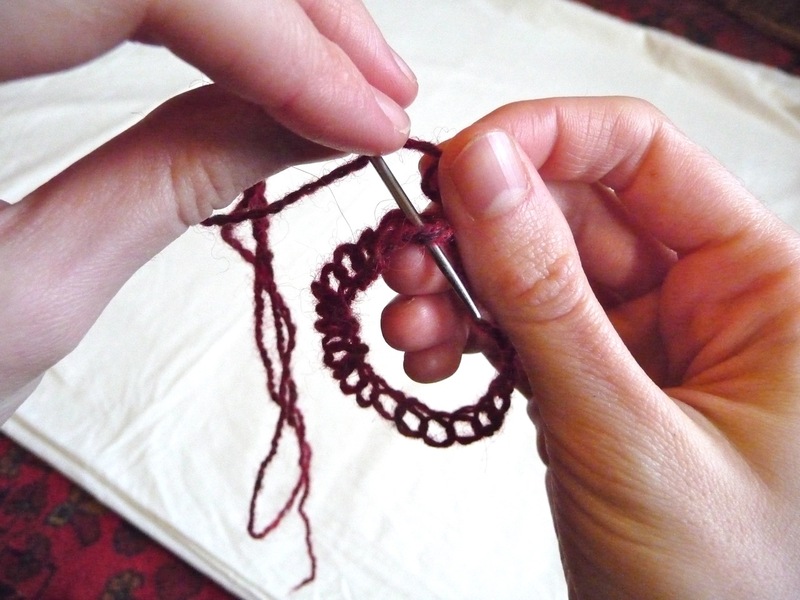 Continue making a new round of stitches in this way, working in the opposite direction to the orientation of the needle. 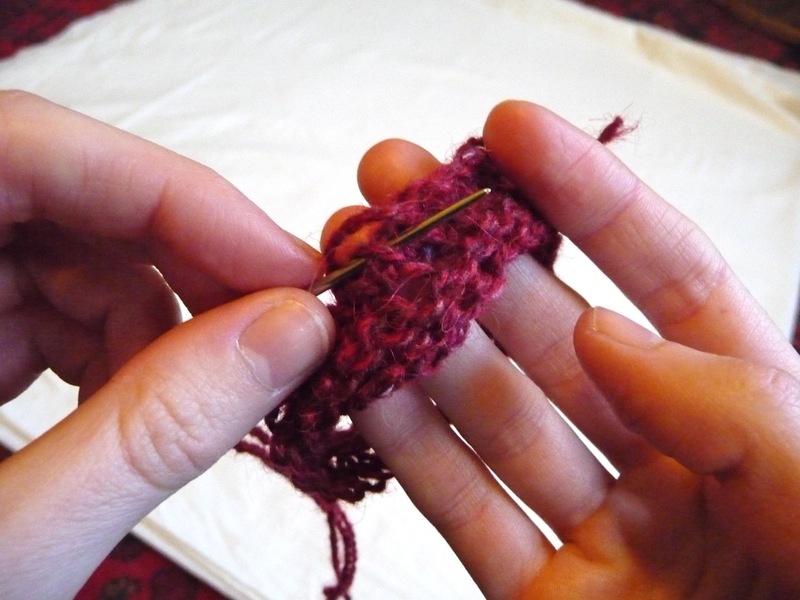 Once the yarn becomes too short to work with, knot a fresh length of yarn to the end and continue stitching. 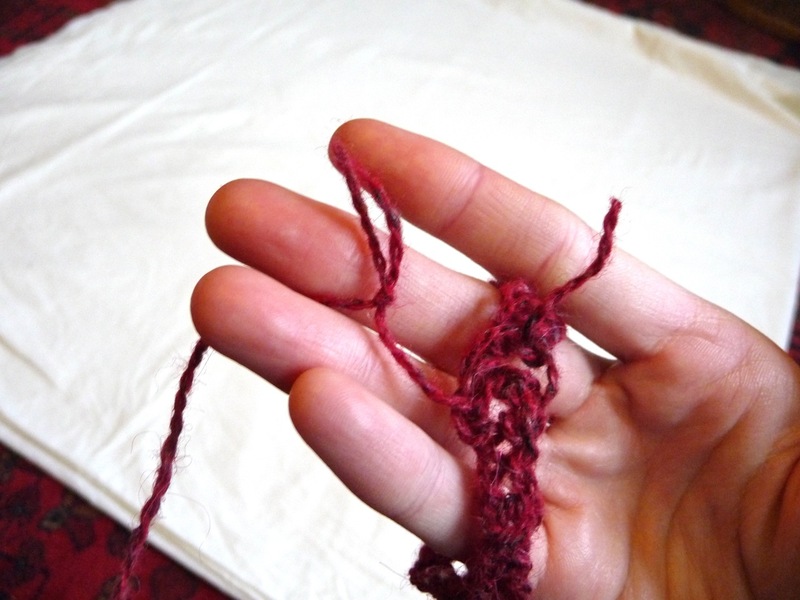 Continue working rounds of stitches until the band reaches the desired thickness. Sew in any tail ends to finish.